Their 1954 ranch house on a street once called “Doctors’ Row” is traditional both inside and out, with a gable roof, stone-clad front facade, double-hung windows, brick fireplace, crown molding, hardwood floors and separate rooms for entertaining, dining, cooking and denning. But no one would accuse the Harrisons of having a bland ’50s-sitcom home. 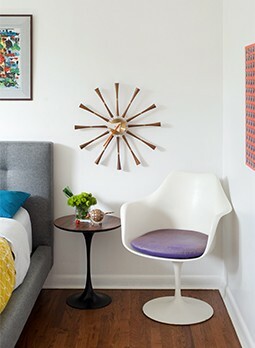 The smokin’ hot colors they’ve chosen, the punchy retro furnishings and the collectibles Jen has transferred from the bungalow assure that their house makes a distinct impression. Custom built on a lot and a half, the 2,600-square-foot home has only two bedrooms, but they’re big enough to roller-skate in. The living room and the kitchen with its dinette breakfast area, are similarly spacious, while the dining room and den are more modest. Two baths in virtually original condition, plenty of storage, a pool and a bonus room in the garage convinced the couple to move their aesthetic forward several decades. Their furniture and collections range from 1930s Fiestaware and a Heywood-Wakefield dining set to Todd Oldham chairs. 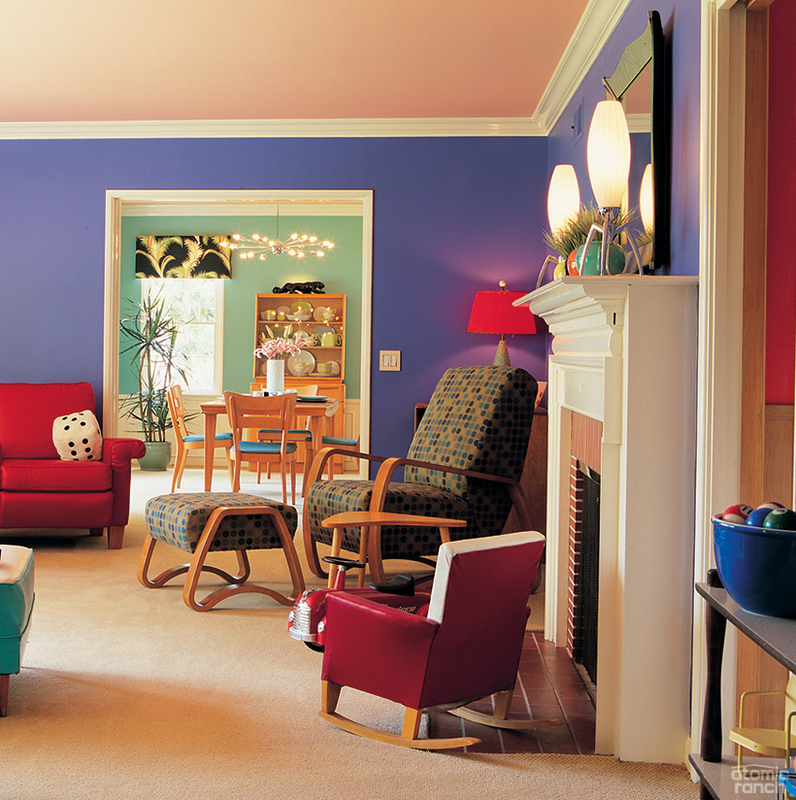 A turquoise and white vinyl sectional reminiscent of a ’55 Chevy and a child’s red rocking chair share the living room with lots of decorative touches— teapots, pillows, polka-dot Fire King bowls, vintage and new accent lamps. Jen Harrison treats the display area in the entry hall like a “New York Macy’s window”; this tableau is an ode to Anaheim’s history as a citrus capital. “Some folks accessorize themselves; I accessorize the house,” she says. The staid elements—a classic fireplace mantel, double-hung windows and beige carpeting—bow to the color and displays the Harrisons brought to the house. New pieces include the polka-dot and two red chairs, both by Todd Oldham, the sputnik light in the dining room and accent lamps on the mantel. The sectional couch, child’s rocker, floor and pole lamps and Heywood-Wakefield dining set are vintage. The room seen on moving day, inset, is a far cry from today’s vibrant mix. 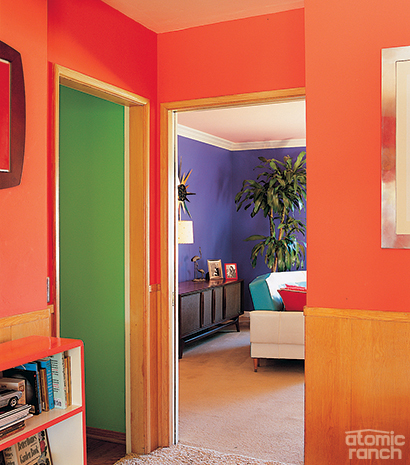 The industrial-strength color they applied to their home begins on the walls. 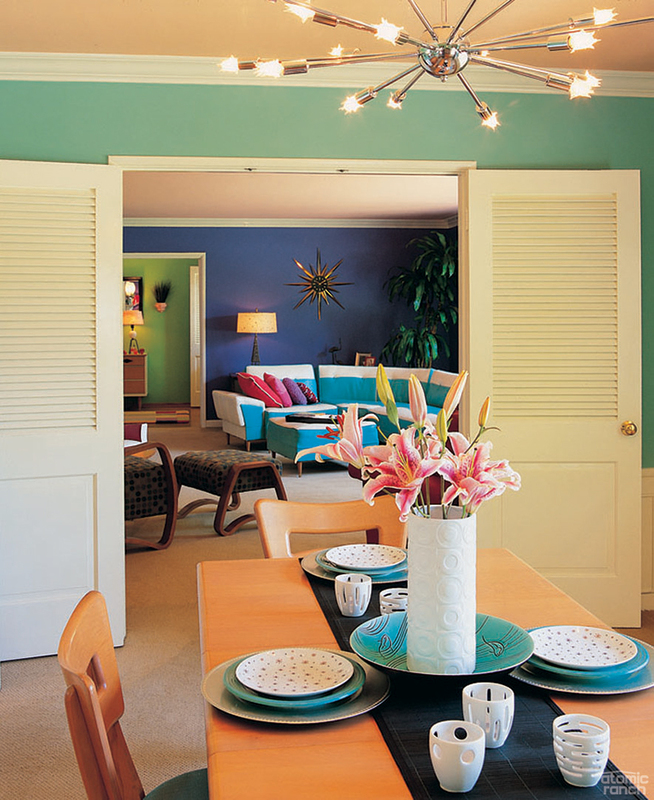 The entry hall is lime, the bath and dining room turquoise-y, the master bedroom wisteria and the kitchen has gray-green cabinets with pink-plaid wallpaper. Their 1920s cottage was also vibrant, but none of the paint shades they’d used seemed to look good in the new house. The coral hue in the family room is a warm foreground for the views into the purple living room and the bright-green entry and hall. The vintage Packard Bell hi-fi once overheated and filled the house with noxious smoke and firefighters. While those who ascribe to brown-on-beige-on-black neutral interiors might consider the combinations strident, much thought and trial and error went into finding colors that work in a given room as well as playing off the palettes in adjoining rooms. 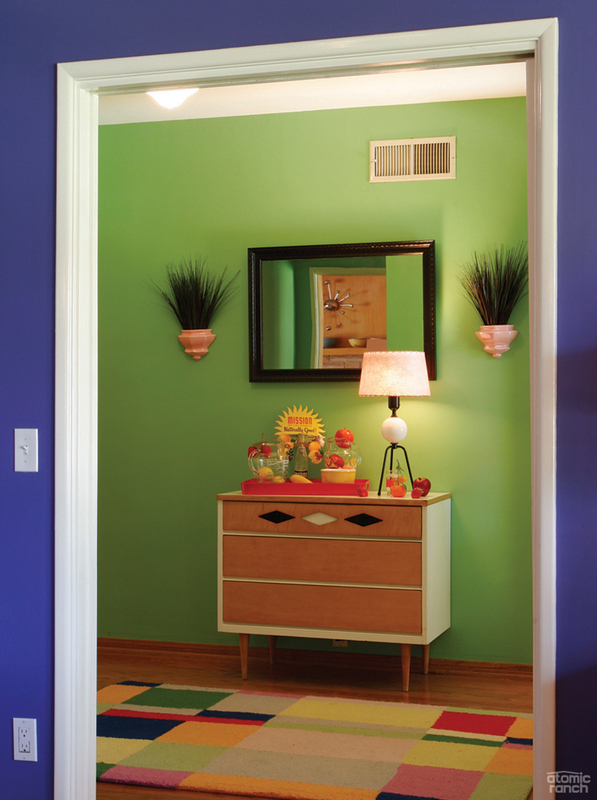 “We wanted the den to be a vibrant color, yet soothing,” Dan says. “We went back and forth between cool colors and warm colors; we finally found this awesome coral. Dan came from a Star Wars–poster aesthetic and admits he’s more streamlined, while Jen’s approach is more if-you’ve-got-it-display-it. Their bungalow lent itself to decorative things on pretty much every horizontal surface, but in this house more items are stored behind closed doors. Setting the Heywood-Wakefield table are vintage turquoise Fiestaware along with chargers from Target, starry plates from Crate & Barrel and a vase and tea lights from Illuminations. The collectibles include Noritaki china, vintage toasters, refrigerator storage containers, melamine canister sets, and Bauer and Fiesta pitchers, vases, plates, cups and bowls—lots and lots of bowls, at least 30 just counting the Pyrex ones. 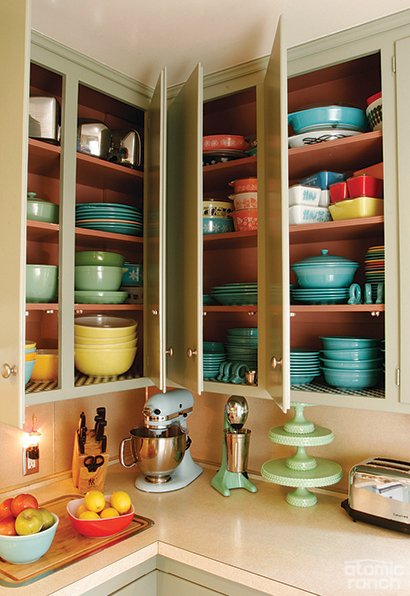 Jen kind of fell into collecting the Fiestaware when she stumbled across a large trove of turquoise dinnerware, but now limits her purchases to newly released disc pitchers. A veteran who’d brought Noritaki china back from Japan during the Korean War for his two daughters thrust a set upon her at a yard sale. Turquoise, blue, red, yellow and green. Jen likes her colors and keeps them abundantly present in her kitchen. The old kitchen aid mixer and tiered food platter display some of her favorite styles. That means the Harrisons’ house doesn’t qualify for California Mills Act status, while their previous bungalow was among 150 Anaheim residences that benefit from the property-tax-saving benefits—which makes Jen grind her teeth a bit. But they’re patient and believe change will come through education and exposure.